The history of Huguenots is long and complicated – too complicated to discuss here in any depth. For a long time, many people believed that there were no Huguenots in New France, a viewpoint that is still held by some. This attitude is due in large part to the French government’s active hostility against Huguenots as well as their refusal to allow anyone not of the Catholic faith to settle in New France. 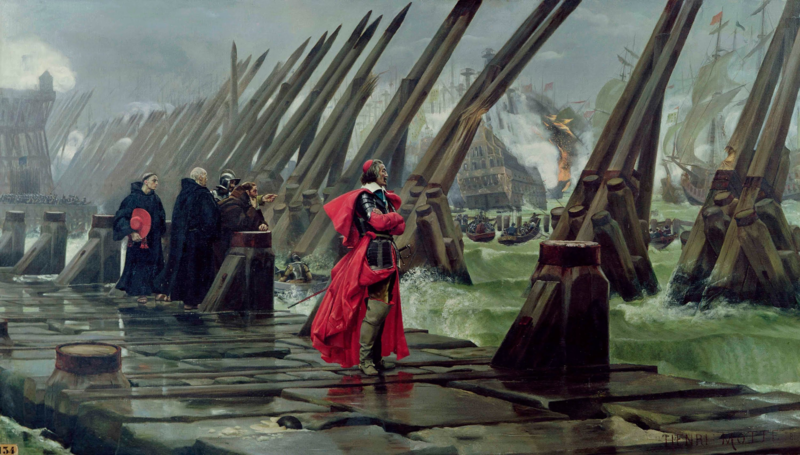 While Huguenots were guaranteed certain rights by the Edict of Nantes (1598), by the 1620s, religious civil war broke out again, creating not only bad feeling but also a wave of war refugees. However, research by scholars such as, Marc André Bédard, J.F. Bosher, and Leslie Choquette, has shown that there were small communities of Huguenots scattered across the French colonies of the New World. While the ban remained in place for the entirety of the French Regime, it was difficult, if not impossible to regulate and monitor the flow of people in and out of New France. After all, seventeenth century New France at this time was hardly more than a group of ramshackle forts constantly under threat of attack, and colonial administrators had no real way to control who came and went. A further ordinance of 1676 passed by the Conseil Souverain declared that Huguenots could not settle in New France; it allowed them to stay, if necessary, so long as they did not practice their faith openly. In fact,when it came to rich merchants, the state had no desire to ban Huguenots from operating in the area; for example, a Huguenot of La Rochelle, Bergier Clerbaud, was given a fishing monopoly off the coast of Acadie in 1684. Merchant records, abjuration records, and letters from missionaries complaining about them make it clear that Huguenots were present in New France throughout the French period, despite the laws passed to prevent them from being there. My interests, however, lie specifically with those Huguenots who immigrated to New France as refugees of war, likely knowing they were not welcome, and who therefore took measures to make sure they remained clandestine. I found myself wondering both how did they remain hidden from the Catholic state, and, more pertinently to our interests here, how do we, as scholars, find individuals, or more often entire families, who did not want to be found? With the development of digital databases such as the Project de recherche démographique en histoire (PRDH), the task of finding the hidden identity of families has much become easier. I’ve mentioned the PRHD before in our post on sustainable digital projects, but for a quick refresher, the site itself is a searchable collection of all the parish and census documents from the Laurentian valley settlements, starting in the seventeenth century and ending in 1799; additional data from the inter-university collaboration Infrastructure Intégrée des Microdonnées historiques de la Population du Québec (XVIIe – XXe siècles) (IMPQ) takes these data up to 1849. It’s a treasure trove of online historical data, which allows researchers to trace a family’s trajectory from their arrival in New France, through multiple generations. Most importantly for my purposes, the genealogists who researched and developed the PRDH did a lot of leg work to trace the origins of colonists back to their villages and towns in France, by tracking down original baptism records. These records give us a clear indication of where an individual was born – their place of origin, as well as the church they were baptized in. Armed with this knowledge, it is possible to unlock the stories of people who are traditionally silenced in historical narratives, such as the Huguenots who made their way to New France and led Catholic lives to escape prosecution and civil war in France. To begin my search for the Huguenots of New France, I first needed to select a location (Ville Marie and Montreal Island in the seventeenth century) and a set of documents (census records, from 1666-67 and 1681.) This location and set of documents was important, because it allowed me to assess how the population of the settlement changed between the two censuses. By collating the census documents into my own database, I was able to determine that the population of Montreal doubled in the intervening fourteen years, that some families who had been living inside the walls of Ville Marie in 1667 had resettled in newer, outlying communities such as Boucherville by 1681, and that almost all of the increase in population was due to natural increase – that is to say, in short, many, many children were born. Knowing who was living in Montreal was the first step. Next, I needed to be able to see where the newest immigrants from France had come from, based on the information provided by the PRDH. I was looking for something very specific – individuals who were baptised in Calvinist temples in France, living in New France. This is one of the most reliable indicators of Huguenot individuals. You may be wondering why I did not just look at the geographic origins of new immigrants, and it is true that there are a number of individuals who came to New France from protestant-heavy regions of France. But this sort of data obfuscates the reality of what was really happening on the ground in France; La Rochelle was the Protestant capital of France, yet Catholics still resided there. Paris was considered a “Catholic” city, yet there were certainly Protestants operating within the city. What I wanted was hard evidence of people’s association with Calvinism. And thanks to the work done by the PRDH’s genealogists and the readily available records, I found it. While I don’t have time to show you all of the amazing research that I’ve found (stay tuned for the dissertation! ), I can show you a couple of examples of how I used this method to identify Huguenots. One of the ways in which Huguenots could hide their identities was by lying about their true origins. Information did run back and forth between France and New France, even if it took a few months; but obfuscation of one’s origins was a simple enough matter if done properly. An excellent example is the case of Anne Javelot (or Chavelot, the spelling varies). Arriving in New France from La Rochelle sometime in the 1660s, she married Jacques LeBoeuf in Quebec in 1667. Leboeuf was from the same province of France as Javelot, from a community called Ciré-d’Aunis, which was reported on their marriage document as “Siray.” Javelot, however, reported her origins for her marriage as “St Nicolas, ville et diocèse de La Rochelle.” (See Figure 1.) Marriage documents were largely self-reporting for this sort of information, and the priest officiating the ceremony was hardly going to make enquiries as to whether the parties involved were being one hundred percent accurate when making such statements. For a casual reader, this document seems innocuous enough. But for a researcher who knows that St-Nicolas is one of the Catholic parishes of La Rochelle, this is a signal, just like it would have been to the Catholic authorities and the surrounding Catholic community: “I am a Catholic. No need to worry about me! I am one of you!” It becomes especially significant when you find out Javelot’s baptismal information (See Figure 2.) As you can clearly see, thanks to the great work done by the PRDH genealogists, Javelot was actually baptised in a Calvinist temple. Figure 1: Jean LeBoef and Anne Javelot marriage record fromthe PRDH, showing the origins of both parties. Figure 2: Anne Javelot’s individual record, showing her place of baptism. In another instance, the necessary subterfuge was undertaken by the parents long before the individual had to think about it as an adult – an indication of the trying times and persecution the Huguenot community had to live through in the seventeenth century. Jean-Baptiste Soulard also arrived in New France sometime in the 1660s, like Anne Javelot. He was also from LaRochelle. He married Catherine Boutet, a woman from near Paris, and went on to have quite a few children through three marriages. But what’s really interesting about him is his baptism record. (See Figure 3.) Soulard wasn’t just baptised once, but twice – once in a Calvinist temple, and once in a Catholic church. Either his parents wanted to make sure they were covering all of their bases in both religions, or they were Huguenots, and the Catholic baptism was a way of hiding their child’s Protestant identity. Baptisms were a highly controlled and monitored practice in both old and New France, and it would have been an easy way for them to hide their religious practice from the state. Identifying individual Huguenots is central to my research on the community, since it is one of the few ways we can access their lives. Once an individual is identified, we can then trace their life paths, and thereby their communities. Without resources such as the PRDH, these clandestine individuals would continue to remain hidden, and history would continue to focus on the “well known” Huguenot individuals; those who were rich, had power and enough influence to operate in the French Atlantic world with a certain amount of impunity, or those who were caught, and therefore ended up in abjuration records. But thanks to digitization and the more widely available access of such resources, we can learn more about those who successfully emigrated to New France to escape persecution for their religious beliefs in France by living in subterfuge. Leslie Choquette, Frenchmen into Peasants: Modernity and Tradition in the Peopling of French Canada (Cambridge, Mass: Harvard University Press, 1997) p. 27. Marc André Bédard, Les Protestants en Nouvelle France (Québec: Société Historique de Québec, 1978); JF Bosher “Huguenot Merchants andthe Protestant International in the seventeenth century,” The William and Mary Quarterly, 3rd ser. 52:1 (Jan 1995) 77-102; Leslie Choquette, Frenchmen into Peasants: Modernity and Tradition in the Peopling of French Canada (Cambridge, Mass: Harvard University Press, 1997) p. 27. PRDH, Anne Javelot marriage record/individual record. PRDH, Jean-Baptiste Soulard individual record. Malgré tout le respect que je dois aux généalogistes, le PRDH a été l’initiative de démographes de l’Université de Montréal, dès 1966, qui ont entrepris la transcription de l’information des registres de baptêmes, mariages et sépultures sur cartes perforées. Merci pour la correction! Je vais entreprendre de donner tout propre crédit au démographes au future.